A P5 and P6 PSLE preparatory course to writing compositions. Ever wondered how Roald Dahl could hook his readers with his killer character descriptions? Now, you can. With The Write Tribe learn from the best. Our workshops are conducted by real life writers who have written for the real world. 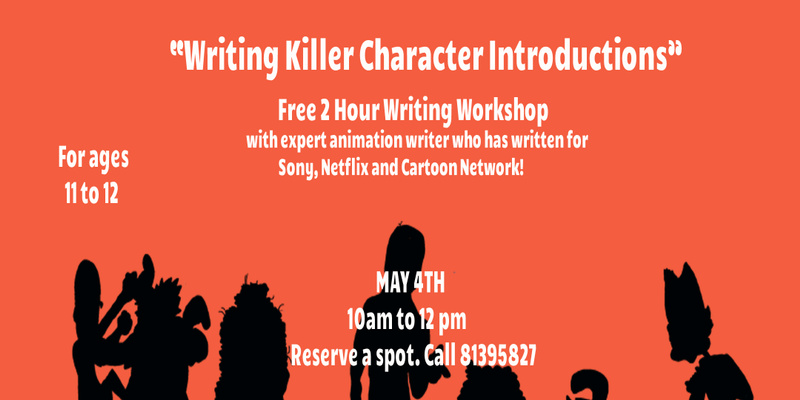 Our workshop teacher, Ms Sabreena, is an animation writer who not only collected awards but also has experience working with Netflix, Sony and Cartoon network. In this 2-hour course, she shares the tips and tricks needed to make characters jump out of the story. Students will learn the hows and whys behind successful character descriptions. Don't miss out! Our classes are interactive and fun and sure to inspire your kids to write wonderful compositions. Our class happens on May 4th, at apples and pencils student care (woodlands) from 10am to 12pm. Call 8139 5827 now to reserve a spot. Only those with reservations will be allowed to attend the workshop. Limited vacancies!